CEBU CITY, Philippinesâ€”Days before Supertyphoon Yolanda slammed Eastern Visayas killing thousands, an online romance was blooming between Houssam Hammoudi, a 31-year-old Canadian Muslim based in Montreal, and Mary Grace Acojedo, 22, of Ormoc City in Leyte. When suddenly all communication via Facebook and Skype stopped on that tragic Nov. 8 and scenes of horrific devastation began trickling out through the media, Houssam was gripped with anxiety. He immediately took a leave from work and set off to rescue his Filipino fiancee. Saving Grace, a mission he undertook alone with single-minded determination and hope, saw him fighting his way through jam-packed airports and seaports to reach Leyte, making his way through rubble and debris, and virtually carrying his girlfriend on his back to get her to a hospital in Cebu for urgent surgery. This love story in a time of disaster has a moving ending. On Saturday, Nov. 23, Houssam and Mary Grace, who is on her way to recovery, were wed in Islamic rites in a hospital room here. Houssamâ€™s heroic saga began when he landed in Cebu on Nov. 14. He checked into a hotel, but he was so worried about the lack of news on Mary Grace that he picked up his backpack and headed straight for the port of Cebu that same day. He got on a ferry at 11 a.m., reaching storm-ravaged Ormoc City, not far from Tacloban, at 2 p.m.
Mary Graceâ€™s brother brought him to a private clinic where he saw his online fiancee face-to-face for the first time. She was in bad shape. Her jaw, left leg, left arm, wrist and some fingers were broken, and she had deep cuts in the face and body. She badly needed surgery, including one to save her left leg from amputation. 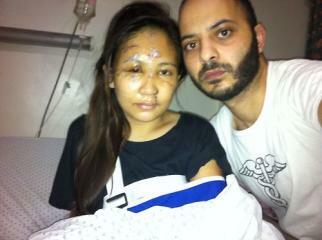 Houssam knew he had to get her out of Ormoc and into a hospital fast. He paid her bills but since the clinic could not even provide her a wheelchair, Houssam carried her out, walking about 15 minutes before he found a tricycle to take them to the port. All ferry tickets, however, had been sold out. Thousands of passengers, including those from worst-hit Tacloban City, had flocked there and were desperate to get out. Crowded ferry Houssam Hammoudi took to get to his fiancÃ©e. Houssam ran to the Philippine Coast Guard office to plead for help. A Coast Guard officer, whose name he could not recall, facilitated their transport on a ferry to Cebu. Arriving in Cebu at midnight of Nov. 15, Houssam rushed Mary Grace to a private hospital where she underwent a series of surgeries. Beside her hospital bed, Houssam launched a blog called â€œOperation Saving Graceâ€ where he narrated how he ended up in Ground Zero and appealed for donations. He had already spent close to P500,000 and much still needed to be done. â€œI donâ€™t know until now how I made it out of Ormoc with her. I still cannot believe it. I realized that no matter what I could do, nothing would have prepared me for this. It was more like a special forces situation. 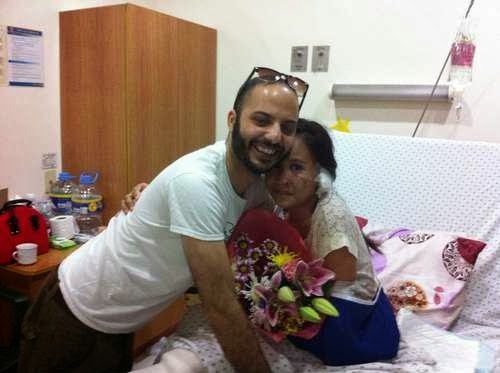 If I had waited only a few days she could have lost her leg,â€ Houssam said in his blog entry posted on Nov. 16. Two days after his blog went out, he was able to raise close to half a million pesos, which will be used for Mary Graceâ€™s continuing treatment. He thanked his company and friends for helping him raise the money. He also sold his car in Montreal for additional funds. Yet something more happened through all this. After the immediate medical emergency had passed, on Nov. 19, Houssam proposed marriage to Mary Grace. â€œItâ€™s the real stuff that we passed through,â€ he later told the Inquirer. Mary Grace, who still could not walk, had put on a white-lace blouse. Her left arm in a sling, and stitches crisscrossing her face, she sat up on the hospital bed as the Imam read the rite. They were joined by Mary Graceâ€™s mother, Grace, her older brother, Nathaniel, her youngest sister, Merry Christelle, and Mary Graceâ€™s 6-year-old son, John Allen. The newlyweds exchanged silver wedding rings bought at a local store. Mary Grace told the Inquirer she met Houssam, a laboratory engineer working for a research and development company, on Facebook eight months ago, and they developed a liking for each other. She had expected to meet him in person in May next year when he planned to come to the country. They had in fact already talked online about marriage. The newlyweds plan to settle in Canada, along with little John Allen, once the major surgeries on Mary Graceâ€™s wrist, chin and leg are completed. In the meantime, Houssam said he would do some home-based work via the Internet from this city while looking after Mary Grace. May The Almighty God , The Most Compassionate, The Creator and Redeemer Bless them and their marriage! SUBHANALLAH ! they both live long , happy, fruitful lives together. Addendum: the muslim phrase "Subhanallah" means = To Perfect Glory it is to God. May The two lovers and their marriage bring Perfect Glory to God...!